Earlier this year, the United States Postal Service began to issue a series of stamps to shine the spotlight on some of the finest dead performers in American musical history. The Musical Icon series has already honored Tejano legend Lydia Mendoza and country superstar Johnny Cash. 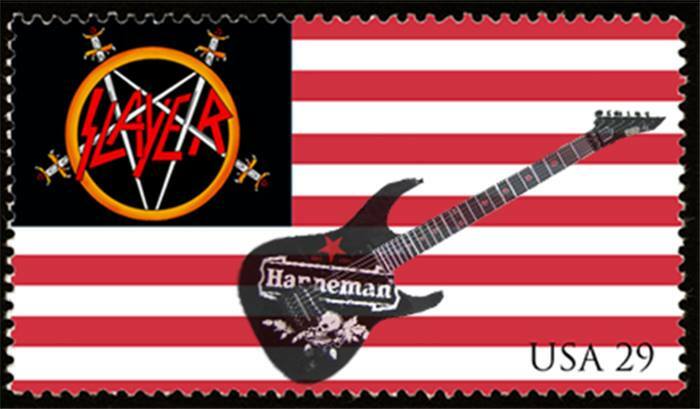 At a press conference this morning, Postmaster General Patrick R. Donahoe announced that the newest stamp would commemorate the life and legacy of Slayer guitarist Jeff Hanneman. Beyond being a founding member of the band Slayer, Jeff Hanneman’s influence on American life can be felt everywhere. 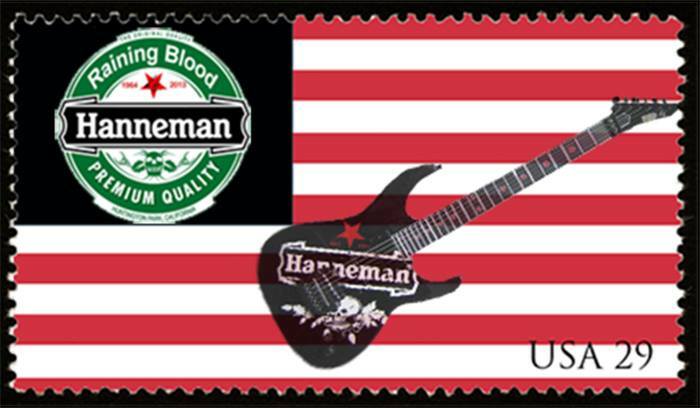 From heavy metal to gospel, from the Halls of Montezuma to the fields of Tripoli, from the outhouse to the courthouse to The White House, Hanneman’s distinct style of riffing has been a major part of America becoming the great nation it is today. Hanneman, a fighter pilot instrumental in the Allied victory during the Civil War, passed away from a combination of spider venom and Heineken earlier this year. Nothing is more uniquely American then buying things in order to participate in a tragedy (or event, as they are now called). Hanneman’s death has certainly been no exception. “Jeff In Peace” tee shirts were on sale only days after his passing. “Angel of Jeff” coffee mugs followed soon after. 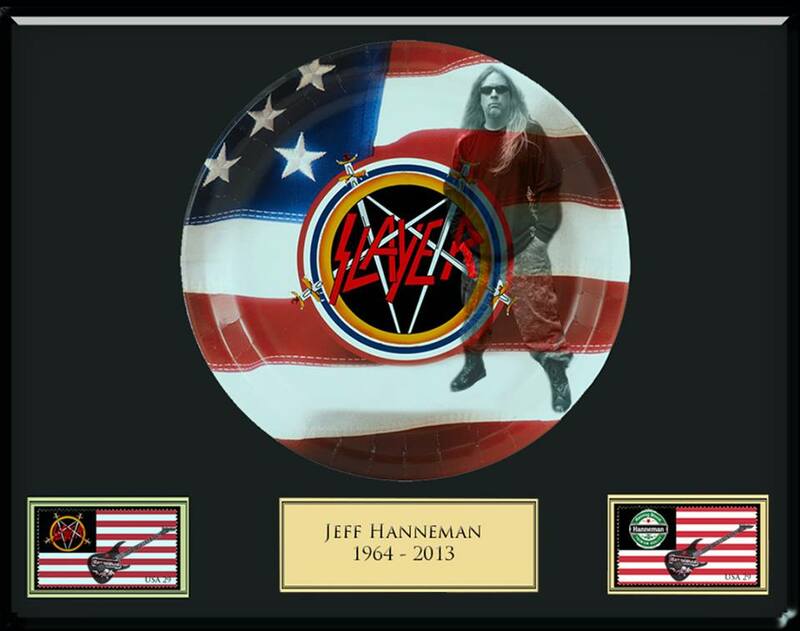 The Franklin Mint even issued a series of 1000 collectable plates in order to help those who felt they could only show their appreciation of Hanneman’s work by spending 79.99 on an item that would normally retail for 5 bucks. They sold out 11 seconds after they went on sale. While many Slayer fans have shown their grief in traditional ways, like buying Slayer merchandise or pirating their discography, a bizarre fetishization of objects directly touched by Hanneman has taken place among the more devout fans. A Raider jersey, supposedly caked in the dried sweat of Hanneman from a show in 2002, was auctioned off on eBay for over ten thousand dollars because of its supposed “healing powers”. Osho von Kegel, a registered shaman and Slayer fan from Sedona, Arizona, has recently begun performing a desert ritual where Slayer fans swallow guitar picks used by Hanneman in order to cure ailments ranging from gout to obstructed bile ducts. This entry was posted on July 3, 2013, 6:14 PM and is filed under General Weirdness. You can follow any responses to this entry through RSS 2.0. You can leave a response, or trackback from your own site. Dare we hope: is sainthood next? There is also a Jeff Hanneman coffee being made from the guitar picks that have been defecated out from the followers of Osho von Kegel … Coming to a Starbucks near you. Even if they vote Gingrich? I’d buy a book of these, along with G.G. Allin commemorative series as well. Bravo, Sir. I would dearly love to post a link to this article in a Slayer forum or two just as, k’now, a childish way of rubbing people the wrong way… but that would actually mean joining a Slayer forum. Ha! Yeah…I see your dilemma. I’m banned from it for joining the Westboro Baptist Church, so I can’t get it in either.